As a librarian myself, I really enjoyed this novel about librarians who are also dog shifters. 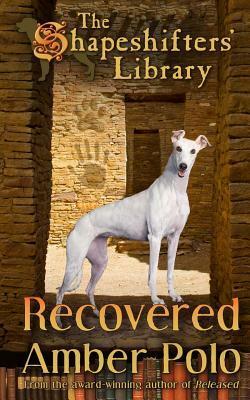 Recovered is a wonderful cozy fantasy novel about Bliss, a new age children’s librarian who can shift to become a talking white Greyhound, and Harry, formerly a banker as well as a reformed werewolf who is also half Old English Sheepdog. They are searching for the most valuable library on the planet. They must outwit Harry’s ex-wife, Sybilla, and her new cohort, Blaze, both of whom are vicious werewolves bent on destroying all books, all libraries, and especially all dogs and dog shifters. While Recovered is the third in The Shapeshifters’ Library series, it reads just fine as a stand-alone. Each book in the series focuses on a different problem and has a different set of main characters. The books are linked and there are continuing characters, but Bliss, for instance, was a minor character in the first novel and a slightly more important character in the second, but Recovered is her shining moment and shine she does. Bliss is a very well-developed, wonderful heroine, demonstrating both strengths and weaknesses, standing up to the villains even when she is terrified, and in the end demonstrating all the qualities that most of us hope for in a heroine. I also liked Harry, who has lived all his life with werewolves who are vicious, power-hungry individuals, and who ridicule him because he is a half-breed who cannot be like them no matter how hard he tries. He learns, with help from Bliss, that he is a kind soul and in their travels he also learns that not all werewolves are like his parents and his wife. This novel is a coming-of-age story for Harry as well as for Bliss. Lovers of fantasy, especially book lovers and dog lovers, are sure to be charmed by this unusual, action-packed novel. I can recommend it highly and I can also recommend the rest of the series. I was lucky enough to be able to read all three in order, and while that is certainly not necessary since each book is complete in and of itself, it was, for me at least, the way to go. Amber Polo is a gifted writer and it is a real pleasure to read such a fun and exciting fantasy novel.